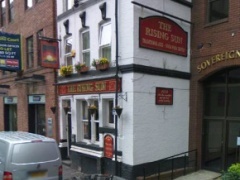 The Rising Sun, Manchester, M2 5HX. The Rising Sun pub review, map and rating. Looking for a Hotel near The Rising Sun? I DONT NEED TO SAY ANYNORE! Great pub sat around some dreadful public houses, always a very good pint in here, i can never walk past without popping in. Its quite pricey but ale top notch! Nice to see the M.D of the Moorhouse's brewery present at the presentation of the pub of the season award last week. Good pub with excellent ales. Its good to see pubs like this one win awards like that. Good place to go at dinner times. As an RBS employee past and present employees congregate here. Always busy with very good beers on tap. good place to go. they had a lancaster ale fest on when i popped in this week. very good beer, and night. 10 out of 10 for beer quality! THE RISING SUN HAS JUST BEEN MADE CAMRA PUB OF THE SEASON! WELL DONE TO THEM AS THEY SERVE A GOOD PINT! WELL DONE! To sum up...... Fantastic pub with fantastic ales! Love the place. Exellent pub with lots of choice. 5 cask beers on offer and well up there in quailty. I had half of every cask and they were spot on. Lancaster Blonde, Moorhouses Pride of Pendle, Timmy talors Landlord Blacksheep best bitter And also a mild Twates's Nutty Black. (which is a rareaty if you dont go in to holts's Houses.) Good place to go and will be calling back very soon. this place is a real gem. P.S camra and other breweries were also there! what a night well done the sun and keep it up! i sneeked in to this pub while my wife was shopping over the weekend, and i had a pint of Old Engine Oil (Dark cask ale) which was brilliant. as im from leeds, i will be taking my wife for more shopping trips just so i can pop in here! Great pub. Started to sell Timothy Taylors Landlord which I must say was very good. the Rising Sun has beeb painted since the last time i came and it looks fantastic. Always very clean and the staff are always great. when i was last in last month the owner of the Moorhouse's brewery was drinking in here and also the owner of the Lancaster brewery also bobs in for a pint so ive been told. When i do come in from London i have to have a curry (With 1/2 + 1/2!) Very good food. good little pub very clean. ale was 100% as always. Good little pub with a good atmosphear. The beer was very good and a good range of cask ales too. The owner and manager and the staff are very polite and very chatty. Good all round pub. I missed the food which ive heard is very good but will try and get in sooner when im in from London. This place is a credit to the lads who Own / Run it. Cracking Real Ale Pub. 5 cask beers on all, I have to say were perfect. It was very busy when i went in as the Manchester Markets were on. will pop in again for a pint! Cracking pub, very clean with good staff. this pub is very warm and the food and the cask ale is superb. this is one of the best pubs in manchester for the football with no idiots. Cracking pub, thats all i can say! food menu is 100% the cask ale is exellent 10/10! Very busy pub, and we got served quickly as there were 3 staff on. Tried to get served in the Old Nags Head and waited 10 mins so we walked out. will be going to the Rising Sun again. well run and very clean.